Atlas and the Anchor: TV On The Radio - "Dear Science"
Sometimes when a band creates a masterpiece ("Return To Cookie Mountain") the next record can fall short of expectations. Or sometimes they exceed those expectations and create another great record. 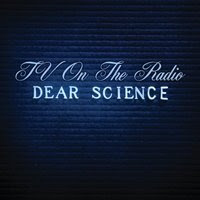 Just as TV On The Radio has done with, the highly anticipated, "Dear Science". A much brighter sounding record, "Science" is less dense than their previous output. Most of the gauze enshrouding the songs on "Cookie Mountain" is replaced with a cleaner sound, focusing the spotlight on the vocals of Tunde and Kyp. New sounds such as handclaps, horns courtesy of members of Antibalas Afrobeat Orchestra, funky Prince-like guitar riffs and even Tunde coming off as a battle rapping MC on "Dancing Choose" contrast their normally dark and gloomy soundscapes and lyrics. TVOTR has made another record to immerse yourself in...so put on your headphones and your dancing shoes. These United States - "Crimes"